10 credit hours and 2 semesters later, with a 4.0 throughout the entire academic year, I developed an intense passion for Chinese language and culture. I also put myself in this sort of situation during my final semester at Wofford College, when I signed up for a 400-level government course entitled “International Conflict.” Needless to say, I had never taken a government course before – but hoped that my Global Book Challenge would at least offer me some foundation so that I would understand the basics of what was going on. Other than having to take a crash course on International Relation theory (hello John Mearscheimer and offensive realism!) through my own self-study, I found myself basking in the course information. We jumped effortlessly in our lectures from Angola to Libya to Ethiopia to the Soviet Union to Turkey to Vietnam to West Germany to East Germany to the United States to Cuba to Nicaragua to Chile. In this course, we covered a good deal of information regarding the Chinese/Taiwanese conflict – a subject which I happened to know a lot about. When I was seventeen, I hijacked the family summer vacation to Washington D.C. I began contacting embassies and cultural centers of countries that interested me to schedule meetings to learn more about their countries. Due to a very close friend of mine from Taiwan, I had developed a personal interest in the country, but hardly knew anything about it from an academic perspective. When I contacted the Taiwanese Economic and Cultural Center (I later learned that Taiwan has no embassy in DC, due to its relations with the People’s Republic of China), they were enthusiastic to host me and my parents. They gave me books, a CD of a Taiwanese classical music composer, and a wind god decoration based on the country’s animistic beliefs. The press officer met with me for almost two hours – discussing everything from the rise of Acer computers and the transition in Taiwan from the low-tech to the high-tech industry, the Taiwan Relations Act passed by the US Congress in 1979, Chinese-Taiwanese government relations, the traditional characters of Taiwanese script versus the simplified characters of mainland script, etc. Looking back on this experience, I feel incredibly lucky to have been the recipient of such understanding and generosity. My entire interest in Chinese culture was sparked by this rather brief encounter. But, back to international conflict: Taiwan was such an important player in my International Conflict course that I wanted to find a book which emphasized this aspect. I found this information in the book, Taiwan: A Political History, a book published by Cornell University Press and written by Denny Roy, a current fellow at the East-West Center. 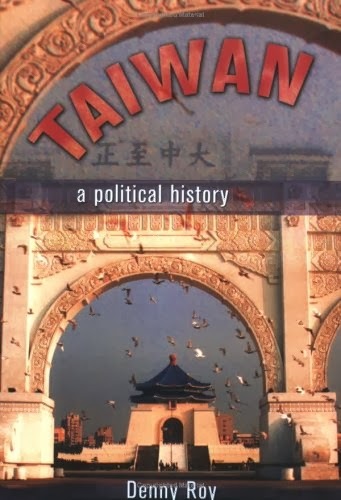 While I knew a great deal about the conflict between Taiwan and China in the Cold War (especially in how it affected the United States), I was most interested to read about the political structures and the political importance of the island before it became home to the government of the Republic of China. By default, it made me wonder how we should view Taiwan today: as a political, anti-communist barrier, or rather as a small, autonomous country which is trying to assert itself as a global player? Taiwan was first inhabited by the aboriginal tribes. Interestingly, imperial China made no territorial claim to Taiwan – leading to Dutch presence on the island from 1624 to 1663, and later leading to a haven of widespread piracy, smuggling, and looting conducted by people of many nationalities. 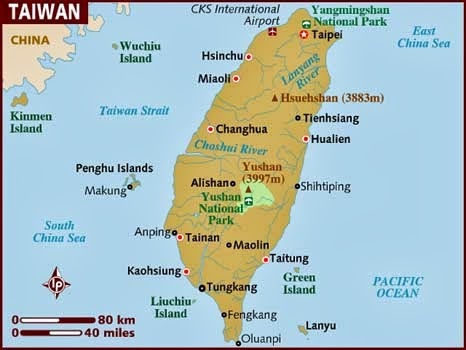 From 1683 to 1895, Taiwan was nominally administered by the Qing dynasty only for the purpose of security and there was very limited Chinese influence on the island. The island later fell under the sphere of influence of imperial Japan, which governed it for around 50 years and which led the island to high levels of development. In fact, when the island of Taiwan fell back under the Chinese sphere of influence, the Chinese were quite worried that in the midst of colonization, the island had become too much like Japan, through the Japanese process of assimilation, or kominka. On December 7, 1949, the government of the ROC (led by Chiang Kai-shek and his political party the KMT - Kuomintang, or the Chinese National People’s Party) moved officially to the island. Over the next 38 years, Taiwan was governed through martial law. According to the author, “The KMT was committed in principle to a fully democratic system on Taiwan, but this had to wait until the Communist threat passed because liberalization would create vulnerabilities the enemy could exploit. Freedom had to be traded for security.” (page 89) During this time of limited freedom, a foundation was created which allowed for great economic prosperity in future years. The Taiwanese economic miracle was built on two policy pillars: 1.) Reducing barrier to education and entrepreneurship - “unleashing the economic potential of Taiwan as a whole and opening up opportunities of upward socioeconomic mobility for individual families” (page 97); and 2.) Government administrative guidance. It was only following the death of Chiang Kai-Shek in 1975 and the ascension of his son Chiang Ching-kuo to power that reforms were brought about to loosen the control the KMT control of power. When discussing Taiwan, it is important to understand Taiwan today. First of all, the KMT (the original leaders of the Republic of China) has not retained complete power in Taiwan. Although the current President of Taiwan is a member of the KMT, his predecessor Chen Shui-bian (who held power from 2000 to 2008) was not of the KMT Party, but rather of the Democratic Progressive Party, DPP. It might also be worth mentioning that he was also a native-born Taiwanese. Based on these recent democratic changes, we must determine how we should define Taiwan – taking into account its relationship with China, but not defining it solely by this relationship.